The museums exploring the history of gastronomy are a novelty in their category and there are yet not many of them around the world. The Gastronomy Museum is visited by people from around the world, both laymen and professionals in the field of Gastronomy. Among the professionals is Orest Kramarczuk from Minneapolis. 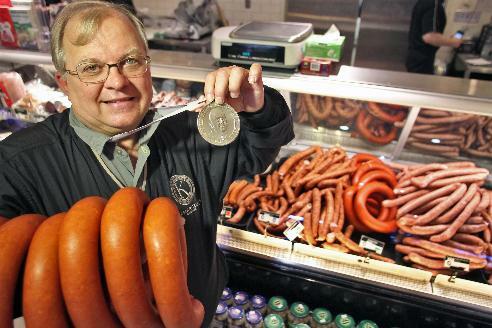 Mr Kramarczuk continues the tradition of his ancestors who immigrated to the United States from Ukraine and founded the Kramarczuk's company which, among others, became famous for its delicious sausages. The fact that Orest Kramarczuk is successfully continuing their production is evidenced by being this year's winner of the award by James Beard, a famous American chef. This award is considered an Oscar in the field of Gastronomy. Mr Kramarczuk enjoyed the Gastronomy Museum very much and wish us all the best also in our Visitors' Book. He even called our Museum a gem!